J.C. 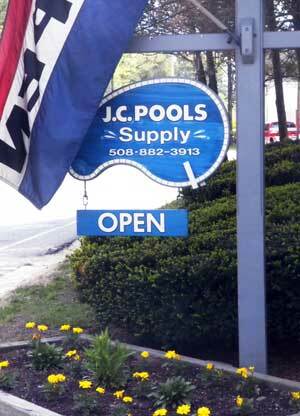 Pools was founded in the 1970s when John Caruso Sr. became a Corinthian franchisee. The current John Caruso worked with his father to start and build their own pool construction business. Since that time, J.C. Pools has built thousands of pools throughout Central Mass. J.C. Pools specializes in in-ground, vinyl liner pools with a range of wall systems using concrete, steel, or polymer. There are advantages to each, which we invite you to explore on our "In-Ground Pools" page. Of course, we offer above-ground pools also – some of which can be installed as partially in-ground! The company's retail store was renovated in the mid 90s to better serve customers. John's wife Betsy runs the store. John is proud to be a member of Aquatech, part of United Aqua Group. This signifies that J.C. Pools is among the best pool builders in the nation. Only the most successful builders who guarantee the highest quality are invited to be Aquatech members. They are held to the highest standards of workmanship and customer satisfaction. Aquatech members not only provide quality, they can provide incredible value through group buying strength, giving them the opportunity to select the finest building materials, while still being competitively priced. Aquatech, the nation’s most prestigious society of pool building professionals, has been setting the standard for beautiful pools and satisfied customers since 1962.